Background: Joe launched his career in accounting more than 20 years ago as an auditor for Westinghouse Credit Corporation. He then honed his skills in small business consulting at The Bottom Line, a Pittsburgh-based consulting company, where he performed accounting software training and installation and worked on a government contract assisting small businesses in the setup and implementation of strong accounting systems. Later, at Kröme Communications, a local advertising agency, he provided controller-level services, transforming the small business’ rudimentary accounting infrastructure into a robust system with enhanced reporting and cash flow management tools. In 2001, with an acquired passion for this type of work, he left Kröme and started YourCFO with a mission to provide high quality controller-level services to similar small businesses. YourCFO Focus: In addition to co-managing YourCFO staff and clients, Joe works both with small businesses and non-profits, providing CFO and controller-level services, which include, among others: month-end closing, financial statement preparation and interpretation, forecasting, and advising. He finds tremendous satisfaction in his work, especially when he is able to help organizations more effectively manage their finances—and their businesses—through strong, streamlined accounting systems that produce accurate, meaningful financials. Fun Facts: Joe was born and raised in the South Hills of Pittsburgh where he now lives with his wife and two kids. He enjoys spending his free time with them, whether that means attending their sporting events, hiking, or just watching a good movie. One other little-known fact about Joe: he’s a closet 1980’s hairband fanatic. Background: Michelle brings to YourCFO nearly 25 years of experience in accounting and organizational management with a background in business, communications, and marketing. As accounting and administrative manager for Project Return, a mental health organization in Tampa, FL, she wore multiple hats, from accounting and human resources to event coordination and office management. On the side, she also handled accounting for the National Association of Women Business Owners and performed QuickBooks consulting work. Later, upon returning to her hometown of Pittsburgh, she became a financial analyst with the Bradley Center, a school and residential facility for children, where she performed a variety of controller-level services including audit preparation and support and month-end closing activities. 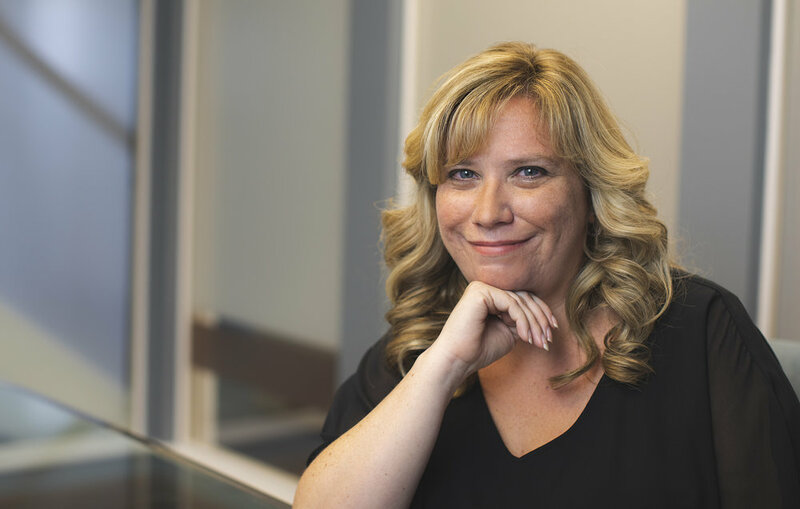 Michelle brings a wealth of financial management, non-profit accounting and marketing experience to the team, and uses her skills to help our clients fill their financial gaps. YourCFO Focus: In addition to co-managing YourCFO staff and clients, Michelle works both with small businesses and non-profits, providing CFO and controller-level services, which include, among others: month-end closing, financial statement preparation and interpretation, forecasting, and advising. She also conducts QuickBooks consulting as a certified QuickBooks ProAdvisor, and she specializes in audit management and support, internal controls, financial policies and procedures, and accounting system setup and clean up for non-profits. She is eager to work with organizations that face significant accounting and management challenges, loves meeting new people, and finds great satisfaction in helping her clients fulfill their missions. Fun Facts: Michelle lived in Florida for eight years where she enjoyed the beaches and sunshine. In 2010, she returned to Pittsburgh after the birth of her first child. And while her two very active daughters keep her busy with their activities, she often makes time to travel and explore the outdoors with her family. Ohiopyle, Presque Isle, Summerville Lake—take her to any place with water! Background: Pamela brings to YourCFO more than 30 years of experience in non-profit development, grant writing, and operational management. She served as development director and executive director for a number of non-profits in Alaska and New York. A former board member and treasurer for several youth non-profit organizations, Pamela has also done independent consulting work in non-profit board training and development, grant writing and reporting, and budgeting and finance. YourCFO Focus: At YourCFO Pamela works primarily with non-profit clients, providing day-to-day accounting and controller services. She specializes in accounting systems customization, audit preparation and assistance, financial reporting, internal controls, and policies and procedures. She likes variety in her work, and she gets that at YourCFO, traveling all over Pittsburgh and serving a broad spectrum of non-profit clients whose needs all present distinct challenges. For Pamela, challenge is part of the pleasure, and she takes pride in knowing she’s had a positive impact on the organizations she serves. Fun Facts: Pamela grew up on the East Coast, lived in Alaska for nearly 20 years, and relocated to Pittsburgh in 2012. She loves traveling (she’s visited 48 states! ), crafts ,sports (especially the Penguins) and doing anything with her husband and 3 children. Background: Mary Beth has been providing accounting services to various small businesses in Pittsburgh for over 20 years. Prior to that she worked as a bank auditor in Dallas, Texas for 7 years. YourCFO Focus: Mary Beth provides support for both non-profit and for profit businesses. She loves the variety of work that YourCFO offers. Facts: As an Air Force brat, Mary Beth lived in four different states and lived in France for three years before moving to Texas when she was nine years old. She and her husband moved to Pittsburgh in 1989. They enjoy spending time with their four adult children. Background: Shawna brings to YourCFO more than 20 years of experience in accounting and financial management. She worked for a local CPA firm where she was the accountant for several profit and non profit businesses in the Pittsburgh area. She was the accountant for several for-profit and non-profit insurance company. YourCFO Focus: Shawna provides daily accounting support for both small business and non-profit clients. She recently passed the exam and achieved quickbooks online certification. The most common services she performs for her clients include bank account reconciliation, credit card allocation, payroll allocation, payroll journal entries, accounts payable, billing and accounts receivable and month-end closing. Shawna really enjoys the variety of her work and enjoys traveling throughout Pittsburgh and meeting new people. Fun Facts: Shawna has lived in Pittsburgh her entire life. She lives in the South Hills with her husband and their 3 children. In her free time she is the business manager for her daughters Cheer squad. She enjoys spending time with family, traveling and her favorite spot is at the beach! Background: Karen began her accounting career more than 30 years ago as a payroll clerk and bookkeeper for Pittsburgh Crane and Hoist, a small, local manufacturing company. Since then she has worked as a bookkeeper for two other Pittsburgh-based businesses, including Kuchar, Turek & Associates, a local CPA firm, and J.S. Smith Insurance, as well as a staff accountant for Cosentino and Associates. YourCFO Focus: Karen provides daily accounting support for both small business and non-profit clients. The most common services she performs for her clients include bank account reconciliation, credit card allocation, payroll allocation, payroll journal entries, accounts payable, billing and accounts receivable, month-end closing, and cash flow maintenance. She is proficient in QuickBooks, online and desktop, and has worked extensively with payroll reporting from ADP, Paychex, and other payroll providers. One of the aspects of her job that Karen likes most is the diversity of tasks; she does something different every day. She also appreciates the flexibility of her position, as she conducts her work for some clients from home, and for others she operates on-site. Finally, Karen loves a new challenge. A hard worker, she’s easy to get along with, and she enjoys meeting people from all over the region. Fun Facts: In her spare time, Karen enjoys urban hiking with her husband in our beautiful city. She likes biking and paddle boarding, too, but she most of all she loves spending time with her family. Background: Maureen joined YourCFO with a 20-year history in accounting and financial management. In her early career, she served as an auditor for the Naval Audit Service, and in 1994 she earned accolades as Auditor of the Year. She’s also worked as an auditor for Integra Financial Corporation, cost analyst for Contraves Brashear Systems, financial analyst for University of Pittsburgh Physicians, and accountant and analyst for Allegheny Natural Resources. YourCFO Focus: A certified QuickBooks ProAdvisor, Maureen performs accounting functions for both small business and non-profit clients, including general ledger account reconciliation, cost and financial analysis, labor and benefit allocation, point-of-sale system interface reconciliation, pension and sales tax calculation and payments, bank reconciliations, and accounts receivable and accounts payable functions. In her day-to-day work, she appreciates the diversity of services she provides to clients and enjoys the challenges of problem-solving for clients from such varied industries. Fun Facts: A native Pittsburgher, Maureen traveled the country (frequenting beachside locations!) in her work with the Navy. She now resides in her hometown with her husband and three teenage children. In her free time, Maureen loves spending time with her kids, supporting their activities, reading, playing softball, and taking Zumba classes. Background: Ray began his accounting career some 30 years ago in non-profit healthcare. After serving in a number of financial and administrative management capacities, he began a long tenure in the legal field as a CFO and Legal Administrator in medium to larger sized law firms. During this period, he was able to enhance his operations and human resource skills. Ray brings to YourCFO expansive experience in the field of finance and accounting. YourCFO Focus: Ray provides CFO and controller-level services to non-profits as well as small businesses. Offerings include: audit preparation, cash management, month end close, finding efficiencies within the accounting structure/function, accounting system selection and implementation as well as internal controls and financial statement analysis. Fun Facts: Expanding on his love of animals, Ray does pet sitting & dog walking in his spare time and enjoys watching old movies. He also likes game night and traveling with his family. We are always looking for qualified, motivated professionals to join our team. If you’re interested in working with us, please submit your cover letter and resume to info@yourcfo.us.